What You Need To Know Before Telling Friends About Your First Reading! The day after my first reading with a medium, I sprinted into my office and dialed up my friend David to tell him the news of the prior evening’s activities. Interestingly, laying news of this nature on somebody, even one of your best friends, is not something for which we become prepared in the course of normal everyday events. How was I going to bring up this subject? “Hi Dave, talked to any dead people lately? I have!” Nonetheless, after the initial small talk about weather and work, I blurted it out. Well, blurted might be an exaggeration; stumbled is a better description. The first thing I found myself doing was setting the whole story up before presenting it. “Now, David, you might think my cheese has finally slid off my cracker, but I assure you that what I’m about to tell you is true.” Inevitably, I wrestled my way through the setup and moved on to the reading itself. David accepted the tale like a true friend. “Wow, that is a lot to take in, Bob. If it were coming from anybody else, I’d never believe it.” There was a long pause. “Phoebe is gonna freak when she hears this story. Tell me more, tell me more” (Phoebe is David’s wife). It helps to know that David is a computer guy. I really don’t know his exact title, but he works with computers, so he’s basically a left-brain personality. In other words, for him to accept this, he really had to hear some evidence. And I was prepared to give him all the details. You see, to me—at this early stage of my adventure into mediumship—the details of my reading were all the evidence anyone could possibly require. With a three-hour reading, I had pages of details that I had written down while the medium talked. As far as I was concerned, I had the equivalent of scientific proof (so I thought). But as I began presenting it to David, I quickly learned that “proof” is subjective when it comes to matters of spirituality; and to really affect one’s beliefs, the evidence must come from personal experience. I told David how my father and grandmother had given me numerous names of people in my life, far too many to call it lucky. The medium even mentioned David’s daughter’s name, Daisy. (People love to know when they’re included in a reading. It always grabs their attention.) She also gave me the names: Carol (my mother), Melissa (my wife), Kris (my friend), Kristen (my friend), Jamie (my friend), John (my friend), Emily (my aunt), Steve (my cousin), Pam (my cousin / Steve’s sister), Mary (my grandmother), Joseph (my grandfather), Scott (my brother-in-law)… and Brian, who the medium described as, “a cousin who is more like a brother to you.” Brian was a younger cousin of mine who came to live with my family after his parents died in a plane crash. The medium was aware that my cousin, Brian, was ten-years-old when both his parents died in that plane accident. Brian’s mother is the “Emily” mentioned in the list of names my grandmother gave me. Neither the medium nor I knew why, but Emily presided quietly at my reading holding a white handkerchief in her right hand. For their children’s sake, Brian’s parents had always traveled separately for fear that such a tragedy would occur. Somehow they must have known the plane crash was in their life blueprints. Brian’s grandmother passed away without warning and his parents were forced to fly together from Alabama to Massachusetts in order to arrive on time for the funeral service. That one exception to their rule resulted in one funeral service for all three people—his parents and his grandmother. Brian came to live with us after that tragic event and became part of my family. I was thirteen years old. I continued to tell David how my grandmother and father were both pleading with me during the reading to attempt contact with Brian because we had lost touch with one another over the years. It was the most recurring theme of my reading. My father, through the medium, also told me where Brian lived, where he worked, how many children he had, as well as additional, yet more personal, details about his life. Everything the medium said was correct. David listened with attentive ears and wanted to know everything. I continued to explain how the medium knew, from my father’s communication, that my mother was considering doing volunteer work and that Melissa and I were considering getting a dog. She even knew that we specifically wanted a yellow Labrador. She then added, with uncanny accuracy, that Melissa wanted a yellow Lab and I wanted a chocolate one; but I had decided upon yellow because I wanted to please Melissa. I told David how remarkable this all was, especially considering I had just purchased a Labrador calendar for my office a couple days prior. Except for an occasional comment where David used the word “holy” emphasized with some cursing, he sat in pensive silence, now letting his voicemail system accept all his phone calls. I continued my story by explaining how the medium proved to me that my father is always with me. He described precisely what my home looked like regarding the furniture and its placement in certain rooms. He also mysteriously gave a play-by-play narrative of our normal routine inside our home: how I wrote in my office every evening while Melissa cooked dinner in the kitchen and listened to the news from our mini-television on the counter; and how we read in bed every night with me beside the window to my right and Melissa to my left in the corner. The medium knew we owned a second vehicle, a four-wheel drive SRV. She knew of my sister’s divorce and the traits of her personality. She knew my father loved car shows and baseball, as well as the television shows MASH and All In The Family. She knew about Melissa’s two sisters and described their personalities like she had known them for years. She knew that Melissa and I dreamed of moving to Maine. She knew about my parents’ miscarriage. The medium appeared to know more about Melissa and myself than we knew about each other; and we had been together since she was twelve and I was fifteen, about twenty years prior to this reading. I did call Phoebe to tell her the story, but now the shoe was on the other foot. I finally knew how other people must have felt when telling me their stories about their readings when I was still a skeptic. And thus I learned the first lesson of spiritual experiences: belief comes from personal, not vicarious, experience. If there is even an ounce of skepticism, as there is in most people, individuals need to experience such things personally in order to overcome that doubt. One cannot overcome it by hearing about other people’s experiences. This is why I recommend that anyone interested in such matters have a personal reading with a genuine and legitimate psychic medium. All the reading you could ever do on this subject will never take the place of this divine, life-altering, experience. 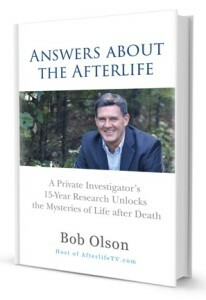 Bob Olson is the author of Answers About The Afterlife and The Magic Mala. He's also the founder of BestPsychicDirectory.com (this site).